I’ll talk in a moment about the software I used (which is fun in itself) but first here are a couple of case studies. 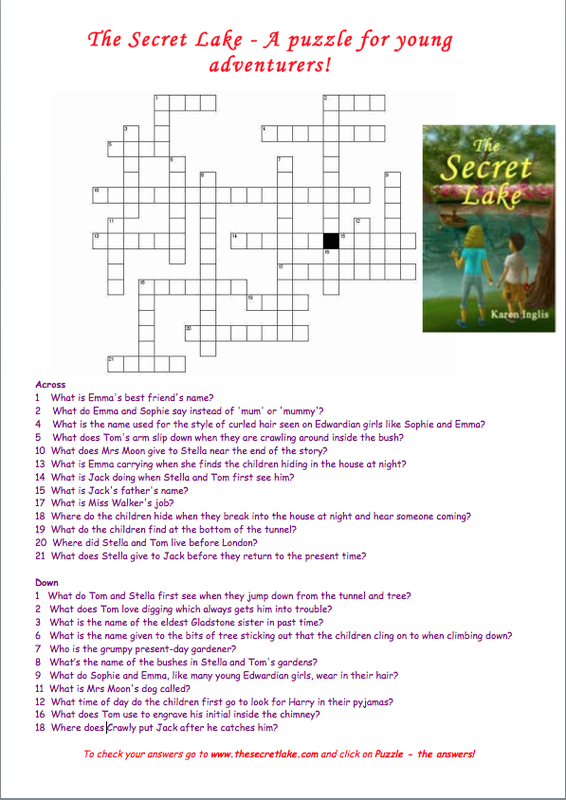 My crossword for The Secret Lake takes the form of a general knowledge quiz about the story. When wording the questions or ‘clues’ I took care to bring out exciting plot points (without giving anything away) and to allude to characters in a way that would intrigue and tempt the reader of the crossword – ie the child or parent picking it up in a bookshop – to want to find out more. Of course I could have created a simple ‘quiz’ sheet but I’m not sure it would have appealed; the crossword format somehow adds a fresher and more fun dimension. While the software I used offers various background images that you can lay the puzzle onto (at various levels of transparency from 10%-90%) I chose a blank sheet and then added a large image of The Secret Lake book cover in one corner instead, as seen below. I could have been more adventurous, but this was my first go at it and I wanted to make it as easy as possible for children to read the clues. The answers are available to download or view on the book’s website, and this, of course, offers a further marketing opportunity as that site includes info and links to my main author site and other books. The crossword sheet itself is also available to download and print or share from my site which offers a further marketing / social media opportunity. 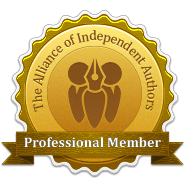 NB I now have a catch-all author website – I don’t recommend setting up separate websites for each book as there is too much to maintain and it doesn’t offer a smooth cross-marketing journey! 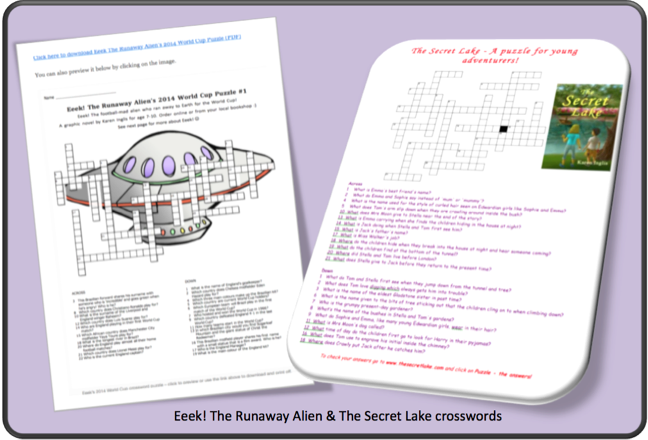 I will in due course move the crosswords over to The Secret Lake section of kareninglisauthor.com – this has been on the ‘to-do’ list for a while! For Eeek! The Runaway Alien – in which a football-mad alien runs away from space to Earth for the World Cup – I used a crossword to pick up on the buzz of the 2014 World Cup. Thus most of the clues focused on simple general knowledge to do with the World Cup teams, matches and players. For the background images I chose an alien spaceship from the puzzle maker site’s library of images rather than one of my own graphic novel images. I then tweeted links to the crossword (which can be downloaded in Word or as a PDF from my website) using #WorldCup2014 and other relevant hashtags being used for specific matches – targeting mainly soccer-loving dads! Because #WordCup2014 was trending at the time, this led to over 50 downloads over a short period. (This may not sound like much but in children’s publishing terms it really isn’t that bad – and all helps to spread the word about the book!) During that period I also I provided handouts of the crossword with books to my local bookshop, which stocks all of my books. I used Puzzle-maker.com to create my crosswords. I can’t say they have the most fabulous looking website (!) and the user interface could do with improving, but bear with it. It’s great fun creating the puzzles and you have the option to play around, preview and then rearrange the shape of the puzzle as many times as you wish if you don’t like the initial shape it comes up with. You start by entering the answer to your clue and then the question – and the program does the rest for you. There are three levels of puzzle: ‘good,’ which comes free; or ‘better’ or ‘best’ puzzles for which there is a small charge: either a one-off cost for one puzzle or an annual subscription which allows unlimited puzzles. The free puzzles come in HTML type format for printing and may contain advertising – I wouldn’t recommend this. By contrast, ‘better’ or ‘best’ allow you to create downloadable PDFs that you can email out, print or share on your blog or website. The paid option also offers a range of background images that you can use to ‘theme’ your crossword if you wish, as I did with Eeek! and the spaceship. All three levels offer the blank crossword with clues underneath plus an answers page. Having done a quick Google I can see that there are lots of sites that offer free crossword making facilities so do check them out and leave a note below of any that you rate! This one worked for me and I’m signed up to its annual subscription service, which at under $15 didn’t feel too onerous! Please do leave links to other sites in the comments box if you’d like to recommend them! One reader on the ALLi blog suggested The Teacher’s Corner website which I shall be trying in due course. Other suggestions gratefully received below for everyone’s benefit 🙂 And of course please do share ideas of other hand-outs that have worked for you. 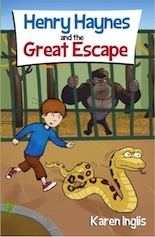 I have recently discovered software that has enabled me to very easily convert my graphic novel, Henry Haynes and the Great Escape, to Kindle and ePub. I had avoided doing this until now due to the formatting costs and headaches associated with converting black and white illustrations. But using my CS files it was a breeze! This entry was posted in Children's Books, Marketing and tagged marketing. Bookmark the permalink. Great idea. I shall be sure to try this out.